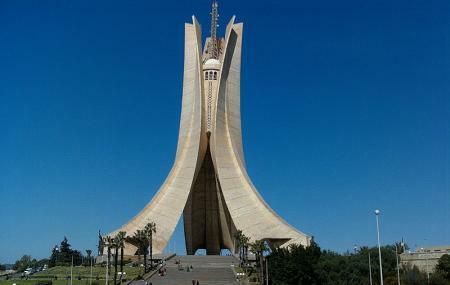 Martyrs' Memorial is a significant monument in Algeria. Opened on the twentieth anniversary of Algeria’s independence, this monument is considered as the architectural and technological wonder. It is shaped like three standing palm leaves with a statue of a soldier at the end. ‘Eternal Flame’ is located beneath the leaves and statues represent the struggle of Algeria for its independence. Panoramic views from the top are spectacular. Visit this monument to know more about the history. Want to plan a DIY trip? Use Algiers trip planner for the same. Add accommodation and hotels in Algiers that suit your budget including the most recommended ones like City Hotel Alger, Az HÃÃƒÂ´tel Kouba and Az Hotel Vieux Kouba. Create your own Algiers vacation packages or choose from the ones made by travel experts. Also explore the best ways for how to reach Algiers. Interesting structure. Unusual methods of construction used. Beautiful views are opening from here. During the night lights up really nice. Can't get underneath it, which is reasonable, since it is a strategic location of ministry of defence. Very imposing monument with significant historical representative. To all this that died fighting for independence. Wonderful views of surrounding area and and bay of Alger's behind monument. A must visit. There is also a museum underneath. A large scale monument clearly revered and honored by the locals. Eternal flame at the center of it's plaza burns only on special occasions. Fabulous views from the surrounding terrace.